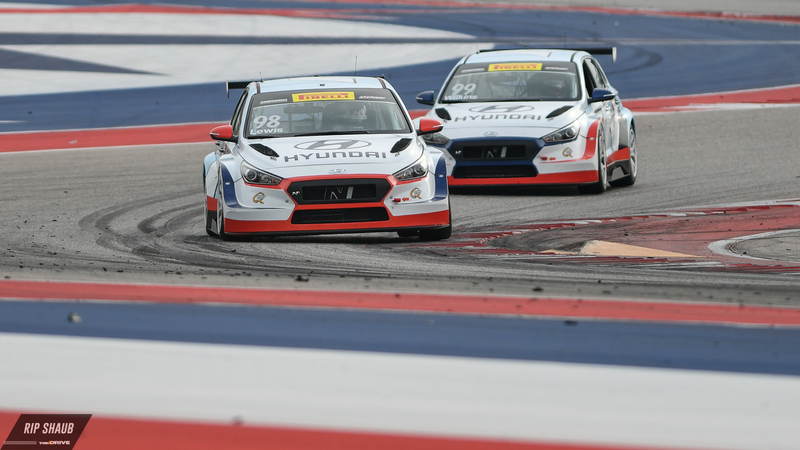 Hyundai and Bryan Herta Autosport topped the TCR field at this weekend's Pirelli World Challenge opener in Austin, Texas. 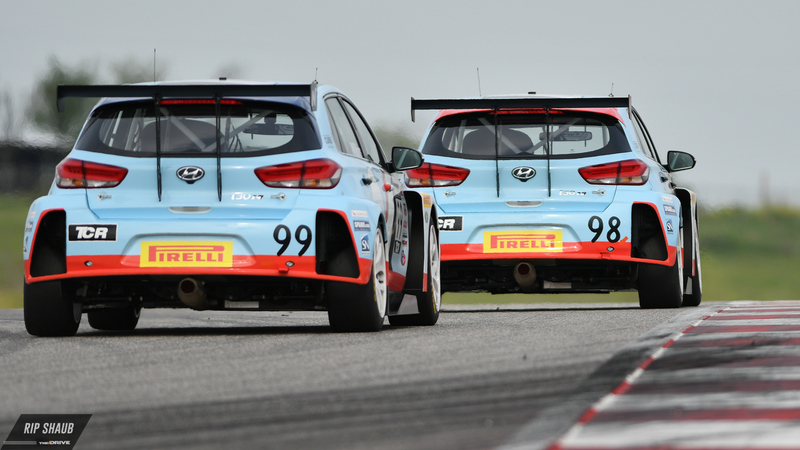 The COTA-hosted event also served as the debut for the Korean manufacturer's i30 N racer in American competition, proving its worth against the established Volkswagen Golf TCR and Audi S3 challengers. In total, the team's two-car effort claimed a pair of victories on Saturday and Sunday, finishing first and second in both TCR class contests over the weekend. Michael Lewis claimed P1 on Saturday after his teammate Mark Wilkins managed pole for the race. During the crew's initial outing, the two drivers promptly swapped places from the start and held tight throughout the 40-minute sprint which eventually ended in a win for the No. 98 Herta Hyundai. Lewis was able to create a gap near the halfway point before Wilkins surged back for a last-lap battle, but in the end, he held onto the lead by a margin of 1.137 seconds. "Mark got me in qualifying and we had a clean race into turn two," said Lewis after the win. "Under braking, he is better than me and he was pushing me. I really appreciate his help in this project." "The Hyundai i30 N TCR was solid throughout the race and we need to consider tire life after this race. On the last lap, I saw a lapped car going very slow in a yellow flag area and I couldn't pass him. Finally, I was able to get by the car and hold off Mark on the final lap for the win. Bryan said to get a clean start and see how the race developed. He wanted us to keep both cars up front. We have a lot of Hyundai people here this weekend that made this program possible and I want to thank them for their efforts." "Michael did a great job and he had a good start," said Wilkins, the second-place finisher. "We were side by side in turn one and the track was a little dirty outside of turn two and I didn't want to press the issue. It was a great 1-2 result for the Hyundai i30 N TCR in its North American debut and we are thrilled with that. It is a start of a great new class and a great product." Ryan Eversley completed the podium in his No. 43 Honda Civic Type R entry. On Sunday, however, the tables turned as Wilkins reclaimed the first position at day's end. The Canadian was once again in close contention with his teammate but tight work behind the wheel of the No. 99 i30 N TCR landed him on the top step. Lewis followed quickly behind with a gap of 0.512 seconds, completing a successful weekend for the team in its first weekend of action with Hyundai. Eversley replicated his third-place position from the day before, this time falling 5.090 seconds off the overall lead. Impressive efforts from the podium finishers completely shut out the typically-dominant Audi and VW race cars, perhaps foreshadowing a more closely-fought battle when they compete next in Long Beach, California, in April. Could Formula E be in Cadillac's future?